We know some of you will be glad you 'red' about this deal. Apple’s silicone cases are a bit more impressive than you might expect. They’re tough and grippy (as good cases should be), but they also manage to ensure the iPhone still feels slim even with that extra protection. Competitors often can't achieve that. 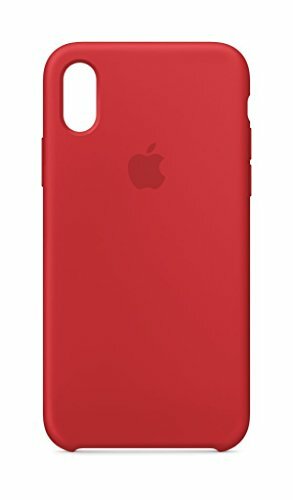 Normally, of course, you’ll pay a premium for this kind of quality because “Apple,” but today you can pick up a (Product) Red or white silicone case for the iPhone X at Amazon for just $33.99, down $5.01 from the usual asking price. That might not seem like a huge deal, but keep in mind that it’s rare to see discounts on Apple’s stuff at all. A warning: Some users are saying that the cases fit the iPhone XS as well, but I retain some healthy skepticism. Some cases don't fit the both phones despite near-similar dimensions owing to some ever-so-tiny differences with the cameras on the iPhone X and XS, but that may not be a problem here. Still, let's get that out there. I can speak about the quality of Apple's new silicone cases from experience. I used a silicone case on my iPhone 7 Plus during the months leading up to the release of the iPhone XS, partly with the intention of confirming some scary reports I’d read about their quality. But I'm unable to come to the same conclusions. The silicone on my case remained attractive the whole time, and I could easily use a towel to brush away and grease or scuffs. Within a few seconds, it'd look almost brand new. The silicone was comfortable to hold, and I've never held another non-bulky phone case that made me so confident that the phone wasn't going to slip out of my hands. Apparently Apple’s previous cases were “stickier,” but the Cupertino company seems to have fixed that this year. And most of all, I loved the way it protected my phone while keeping it so slim that I barely noticed it when it was in my pocket. On some occasions, I even briefly worried that I'd lost it. The only real downside of the case is that there's no protection along the bottom or the front-facing glass, which might mean trouble if your phone hits the pavement at just the right angle. On the other hand, this lack of a "lip" across the bottom means the case is far less likely to get in the way of the swipe-up gestures of the iPhone X models. I'm already finding that "blockage" annoying on the temporary case I'm using for my iPhone XS Max. There's some good with the bad, in other words, and overall I believe this an an excellent case.